Happy Vesak Day! Today is a national holiday in Singapore, so my wife and I took it easy. A month or so ago we began planning a trip to Bangkok over this weekend, but we decided against it as we have 2 months of lots and lots of travelling coming up, so we thought we'd take it easy and stay put for the next few weeks. Hopefully this will give me a little more time to write up some more reviews. This "Double Smokin' BBQ Beef Burger was a limited time promotion, and was yet another item I sampled on my trip over to Malaysia a few weeks ago. The others being the Hot and Spicy Shakers, and the Norishio Shaka Shakas. Still have two more items to review from that trip as well. Keep an eye out for those reviews sometime next week. 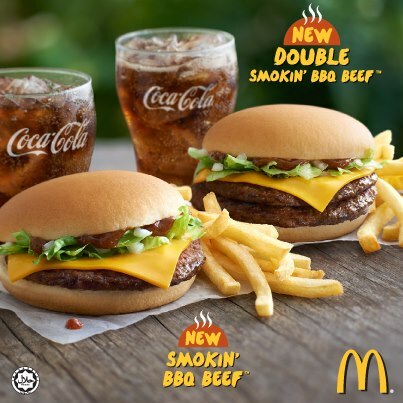 The Double Smokin' BBQ Beef Burger was a limited time promo, and a part of their McValue Menu. It's since been discontinued, and it was only run for about a month. These are smaller burgers, that come at a discounted price. The last one I tried was the Beef & Egg Burger, and they've recently introduced the McPepper (see the photo below). I probably will give the McPepper a miss unless there's nothing else to try on my next trip over, because it is too similar to the sauce on the Prosperity Burger, and the Hong Kong McPepper I've had before. The McValue menu is indeed a GREAT value, as not only did I have a double patty BBQ burger, but I also upsized it to have a large fry and Coke, and it included a free Hot and Spicy McShaker. All that for ~$3USD, it can't be beat! The Malaysian McValue burgers are always supposed to be relatively simple, in order to keep costs down, and the BBQ Beef burger was no different. It was a standard double cheeseburger with all the standard toppings, but this variant included "Smokin' BBQ" sauce. In reality, it was just typical BBQ sauce, nothing overly special, but it was definitely ugly! When I first opened the burger to pick off the pickle, I thought they ruined the burger by including ketchup on it, but after my first bite I was pleased to find that the reddish sauce was only the BBQ sauce. The BBQ sauce was nothing special, and I preferred the Egg on the previous McValue promo, but at that price there's no way it's going to get a failing grade.